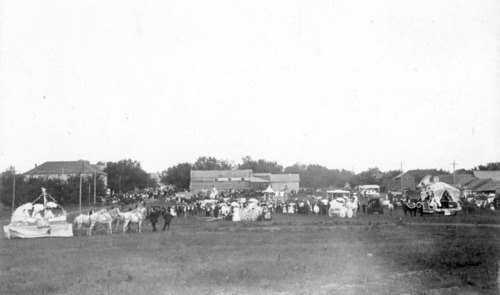 This photograph shows participants in an 1898 parade at one end Missouri Street in Alma, Kansas. The parade celebrated the Woodman log rolling competition. Often these competitions brought as many as 10,000 people to the community. One can see the old south town including Eck Lumber Company to the far right. A. J. Schepp, donor of the photograph, wrote on the back, "Herman and I attended this event and saw the first automobile in Wabaunsee County."